As world activities become more integrated, the rate of data growth has been increasing exponentially. And as a result of this data explosion, current data management methods can become inadequate. People are using the term big data (sometimes referred to as Big Data) to describe this latest industry trend. IBM® is preparing the next generation of technology to meet these data management challenges. To provide the capability of incorporating big data sources and analytics of these sources, IBM developed a stream-computing product that is based on the open source computing framework Apache Hadoop. Each product in the framework provides unique capabilities to the data management environment, and further enhances the value of your data warehouse investment. In this IBM Redbooks® publication, we describe the need for big data in an organization. 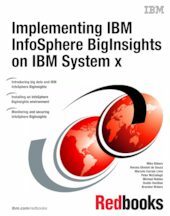 We then introduce IBM InfoSphere® BigInsights™ and explain how it differs from standard Hadoop. BigInsights provides a packaged Hadoop distribution, a greatly simplified installation of Hadoop and corresponding open source tools for application development, data movement, and cluster management. BigInsights also brings more options for data security, and as a component of the IBM big data platform, it provides potential integration points with the other components of the platform. A new chapter has been added to this edition. Chapter 11 describes IBM Platform Symphony®, which is a new scheduling product that works with IBM Insights, bringing low-latency scheduling and multi-tenancy to IBM InfoSphere BigInsights. The book is designed for clients, consultants, and other technical professionals.